RICHMOND, Va.–When the dust settled at Richmond International Raceway, Carl Edwards was the winner, Martin Truex Jr. was in the Chase for the NASCAR Sprint Cup and Jeff Gordon and Ryan Newman were out–all by the thinnest of margins. 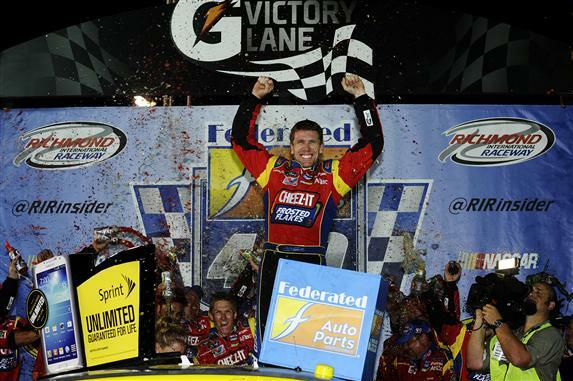 Edwards streaked away from Kurt Busch to win Saturday night’s Federated Auto Parts 400 after a restart with three laps left and beat Busch to the finish line, with Newman running third, Jamie McMurray fourth and Paul Menard fifth. A struggling Joey Logano ran 22nd, but that was enough to keep eighth-place finisher Jeff Gordon out of the top 10 in the standings and out of the Chase by one point. Truex, who came home seventh, kept Gordon behind him in the closing laps and claimed the second wild card entry into the Chase in a tiebreaker over Newman. Busch, 12th-place finisher Greg Biffle and 13th-place Dale Earnhardt Jr. had comparatively easy times clinching their berths in NASCAR’s 10-race playoff. They left the drama to the other bubble drivers. Newman had just taken the lead from Edwards on Lap 391 of 400 and appeared ready to claim a wild-card spot with a victory–which in turn would have kept Gordon in the Chase and knocked out Logano and Truex. But Clint Bowyer, Truex’s teammate, spun off Turn 4 on Lap 393 to cause the fifth caution, one that radically changed the lineup of drivers competing for the series championship. Newman was fifth off pit road under the yellow and unable to drive back to the lead.